Our Michelin-star restaurant in Barcelona...now yours too. Barcelona is a land of flavours. Its unbeatable location bathed by the Mediterranean Sea is connected to its traditional love for cuisine. In recent years, numerous restaurants recognised by the prestigious Michelin guide have appeared in this unparalleled setting, which has turned the city into a true gastronomical constellation. If you would like to have the multi-sensory experience of a Michelin-starred restaurant in Barcelona, with all the freshness and benefits of Mediterranean cuisine, book your table at Enoteca Paco Pérez. In this signature area of Barcelona, the imaginative cuisine of the celebrated Catalan chef is made with the best local produce in the heart of the seaside promenade: Mediterranean ingredients, setting, and inspiration. The innovative cuisine at Enoteca Paco Pérez is prepared directly from local ingredients, fish and seafood from the Catalan coast in particular, to imagine a traditional cuisine interpreted from a modern and elegant prism using the latest culinary techniques. It is not surprising that this venture into the heart and soul of modern Mediterranean cuisine has been twice recognised by the prestigious Michelin guide and is now one of the leading restaurants with a Michelin star in Barcelona. Renowned as one of the greatest examples of 21st century avant-garde cuisine, with five Michelin stars and numerous internationally successful projects, few know that his journey began when he was just twelve years old. At that age, at the stoves in the tapas bar owned by his family, he felt the awakening of a stir that would lead him to be one of the most respected professionals in the world of gastronomy. He combined his studies with summer work in various restaurants and learned from the best: he completed several internships in France with Michel Guèrard, one of the forefathers of Nouvelle Cuisine and holder of three Michelin stars. Returning to his birthplace in Catalonia, he continued training in the El Bulli kitchens with his highly-admired Ferrán Adrià. In 1984, he married Montse Serra, owner of the Miramar, and together they converted a simple hostel on the beach into a pilgrimage destination for gourmet cuisine from all over the world that today has two Michelin stars and international prestige as a modern, avant-garde restaurant. The essence of his origin on the Costa Brava carried over to the Enoteca Paco Pérez at Hotel Arts in 2008, where he continues to develop his innovative culinary ideas while continuing his tireless search for new culinary experiences through other projects such as similarly awarded 5-Cinco by Paco Pérez (Berlin), Eggs, or La Royale (Barcelona). Come in, take a seat, and delight in the purest Mediterranean flavours. The Enoteca Paco Pérez offers its guests a stimulating culinary experience based on the essential elements local cuisine: olive oil, wheat, and wine. Pure ingredients of the highest quality combined subtly and harmoniously, with their properties and flavours provided by essential seasonal products, all from the Mediterranean sea, fields and mountains. Your eyes and palate you will discover prawns from the Cap de Creus, lobster, tuna and squabs prepared with a balanced combination of traditional and modern culinary techniques, giving rise to new shapes, textures, flavours, colours, and aromas. 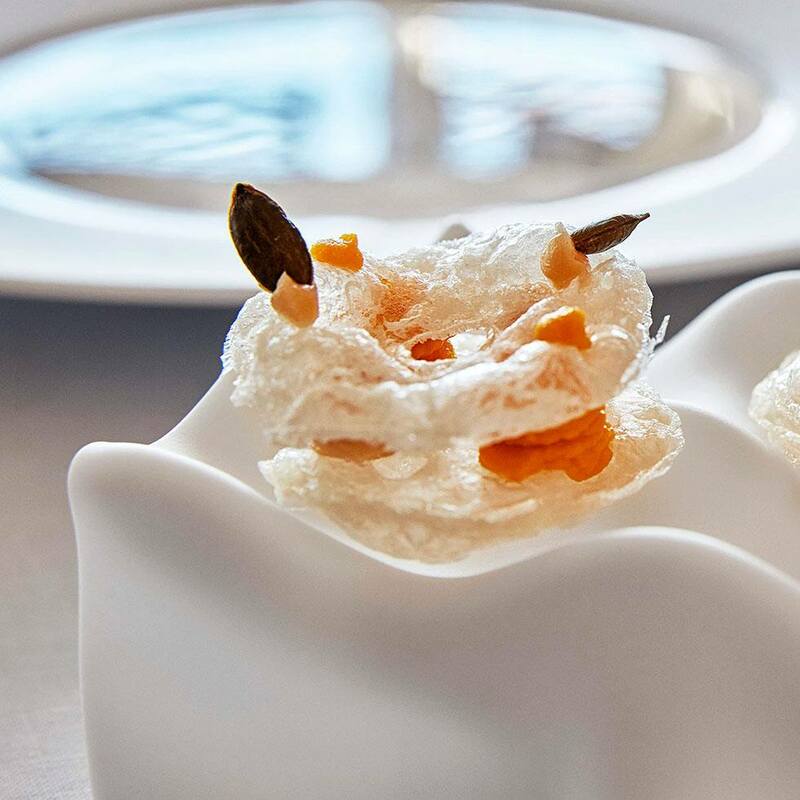 Paco Pérez’s innovative dishes aim to stimulate the senses, based on the essence of nature to imprint the chef’s stamp and mastery on the memory of those who visit his restaurant. It is a unique gastronomic vision sustained by the work, commitment, and passion of a full team of professionals, with chef Alexandre Vehí at the forefront, who works day in and day out to earn the diners’ confidence. In Paco Pérez’s own words: “We cook what excites us, with soul”. Extending out through the large terrace to the Mediterranean Sea from Hotel Arts, bathed by Barcelona’s light and the sea’s aroma, the Enoteca Paco Pérez adds this privileged setting to its offering of haute cuisine. Both the coastal geography of the Olympic Port and the cosmopolitan character of Barcelona play the role of luxurious ingredients in each dish, taking the experience to another level. On entry, the bright open space with a terrace overlooking the seafront embraces diners with its refreshing and welcoming atmosphere, infecting them with the sophistication of the Hotel Arts. With a modern and intimate style, the predominance of whites and light-coloured woods cloaks the lounge simply and elegantly, while its large, light-coloured window frames give way to the charming background, the sea breeze, and the unmistakable light of the Mediterranean. Honouring its name (Enoteca – wine cellar in English), an exquisite selection of more than 700 wines decorates the walls of the restaurant, representing the restaurant’s select and balanced cellar, in which the most prestigious vintages can be found along with more innovative and surprising wines. Wine is the perfect complement to Paco Pérez’s cuisine. To whet the appetite, a delicate and delicious selection of dishes is presented in which the freshness of the sea and the land can be savoured. The menu, perfectly paired with exquisite wines, makes the Enoteca Paco Pérez one of the best Michelin-starred restaurants in Barcelona. Book now and enjoy the Enoteca experience first-hand with Paco Pérez and Hotel Arts, an unforgettable, two Michelin-starred evening.